All are welcome to share a Mass with us. Whether you are Catholic or not, the Mass at Sacred Heart is a beautiful celebration filled with prayer, liturgical music and fellowship, all in Our Lord’s presence. Come for a visit and you will see why our parish is growing! Are Children Welcome in Mass? A resounding YES! Children are an essential part of the Mass at Sacred Heart and are welcome at all Masses. If your child becomes especially vocal, you may choose to join other parents in the back of the church, however it is not necessary. You are welcome at Sacred Heart to come as you are. However, many parishioners dress nicely in a show of respect knowing they will be in the presence of Our Lord. Some women wear traditional chapel veils and if you would like to wear one, there are a few provided in a basket near the main aisle. Modest dress is preferred, especially during the summer months. Can I go to Communion? You must be in a state of Grace to participate in the Eucharist. 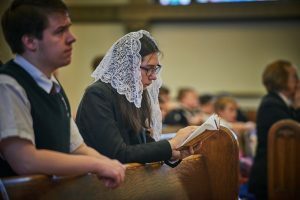 Adults and Children who are not Catholic or have not yet received their First Holy Communion may participate in the Communion procession by crossing their arms over their chest to receive a blessing from the priest or deacon. For a complete explanation read Catechism of the Catholic Church. How is Communion Received at Sacred Heart? As we approach the altar, we kneel and receive communion on the tongue.As Christ is fully present in the Host, the Most Precious Blood is not given. We believe He is fully present in the Host. We do not serve wine. If you require a gluten-free(low-gluten) host, please proceed to the front of the church before Communion begins and kneel in front of Mary. The priest or deacon will then know and accommodate your need. If I attend a Latin Mass will I be lost? If you get to this Mass early, be sure to pick up a red Latin Mass booklet. This is a wonderful tool which will explain exactly what is going on in English on the opposite side of the latin pages. There are a limited number of these available. Keep in mind the Latin Mass lasts about an hour and a half. For helpful links, please see our Resources page.